Ex C.H. collection, Ann Arbor, Michigan. Exhibited: Yale University Art Museum, 2003-2015. 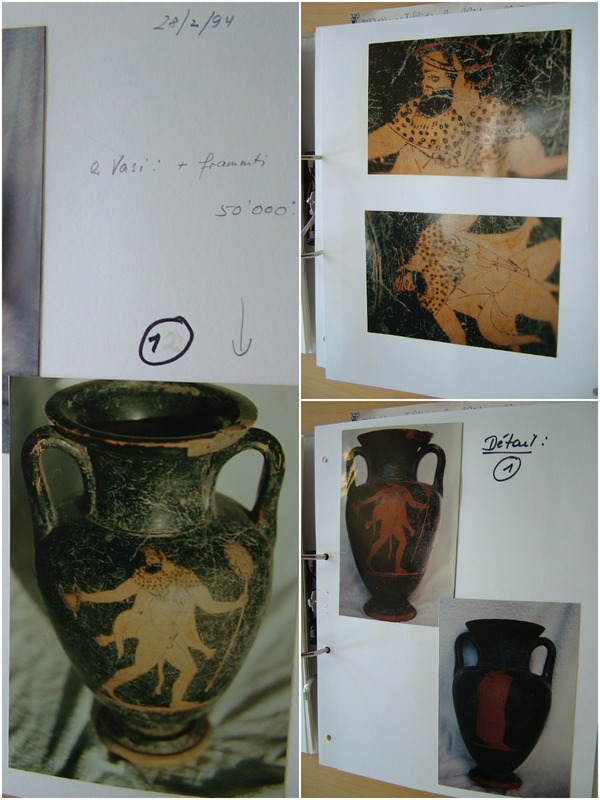 However, the same red-figure attic vase appears also in three images from the G. Becchina archive (image below), which was not mentioned by Royal Athena Galleries. A handwritten note by G. Becchina himself testifies that he had knowledge of the amphora’s existance at least as far back as February 28, 1994. He required the amphora on March 15, 1994, and paid for it April 11, 1994. In Becchina’s records, the amphora appears together with another amphora, which is not depicted here, since it is still in circulation/on the market. It seems as if both objects can be traced back to the looter or middleman trafficker ‘Robertino’; maybe they derive even from the same Etruscan tomb. Since the country of origin (or the country where the illegal excavation took place) of the amphora is most likely Italy, the amphora should be repatriated to the Italian authorities. 2017-02-27 in Destruction of Cultural Heritage, General, Greece, Italy, Selling of unprovenanced items.